Terrorism and political violence have invariably accompanied the progressive modernization of states; a socio-cultural reaction to the problems of social change and development. To understand this phenomenon, it is necessary to consider the nature of traditional society and how it differs from modernity. Starting with a basic history of modern terrorism, James Dingley uses a Durkheimian sociological framework to dissect the role of social relations, culture and religion in impelling men and women to defend their socio-cultural context with violence against the challenge of external forces. 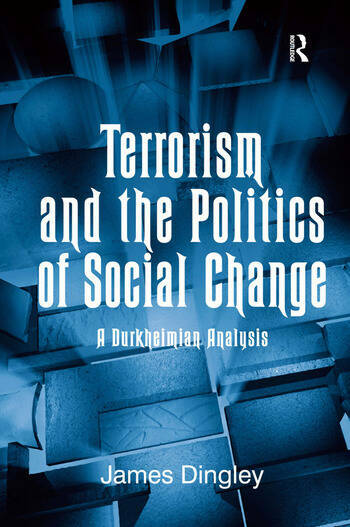 Placing emphasis on a historical and social understanding of violence and key issues such as nationalism, religion, science, the Enlightenment and Romanticism for understanding terrorism in all its forms, this book allows for a more critical examination of terrorism as a response to changes in the organization and cultural goals in a society. It is a decisive contribution to our understanding of the political and social relevance of terrorism as we know and experience it today. Contents: Foreword; Introduction; War and violence: understanding the breeds; Terrorism: understanding the heavens; The heavens described; Making the man - terrorism charted and defined; Terrorism in the modern world; Durkheim, sociology and understanding terrorism; Conclusion; Bibliography; Index. James Dingley is at the University of Kurdistan, Kurdistan, Iraq and a Visiting Research Fellow at Queen's University Belfast, Northern Ireland .